Convenient, fast, and efficient. These three words epitomize our cultural fascination with all things technological. We are a generation of multi-taskers, a society of workaholics, and a group of gregarious extroverts (even if we are internally introverts). Yet, what does God have to say about our strenuous patterns of over-work? How does a jam-packed schedule affect our physical, emotional, and spiritual selves? How does busyness change our relationships at work or within our family? I have struggled with workaholism most of my life, although I probably would never have described it in those terms until quite recently. I’ve always enjoyed being right in the centre of whatever was happening. Being passive is not an option to me. When I was younger I used to be part of a number of extra-circular activities and clubs. In university I served on several campus and church ministries while taking a full course-load, and then in seminary I foolishly worked 4 part time jobs while taking 5 master’s level courses and trying to maintain a rigorous social life. Everyone around me cautioned me that this was not going to be sustainable, but I was convinced that I could make it happen. I dreaded missing out on anything social, and because social occasions often consist of lunches and dinners out, I knew I had to keep up my work schedule in order to afford having fun. This continued until my body finally told me that something had to give. The first time I realized I needed to slow-down was when I was in my first year of seminary. I had moved to the U.S. to engage in a Peace and Theological Studies program, was working two campus jobs (one in maintenance and one at the library) and was trying to get involved in a local church. I remember nearly falling asleep one day in the student lounge when someone mentioned that I didn’t look well. She asked if everything was okay (assuming it was merely an emotional issue). Almost as a bragging point, I mentioned my intense schedule. Rather than sharing in my pride, this woman mentioned that she used to be like me, but because of over-working her body and mind, she had suffered 3 mini-strokes within the past year. I was absolutely stunned. This woman was not much older than I was! At most, she was still in her mid-thirties. I had always assumed strokes and TIAs happened to the elderly due to heart complications. I had no idea that someone under 40 could experience those kinds of effects due to the sheer burden of stress and physical exhaustion. I will never forget her wise words of counsel to me: “You need to slow down because if you don’t, your body will make it happen. Your body knows when enough is enough.” Since that time I have heard that some of my friends have suffered from seizures and other health complications exactly for the same reason: over-busyness. God designed our bodies for work, but also for rest and relaxation. He designed us to be driven and motivated by causes we are passionate about, but he also created us for community and inter-dependence. What does the Bible say about over-work? According to the Scriptures, what is the best balance for a work-play-rest rhythm? So, more practically, what does taking a rest mean for the average ministering person? It means making daily devotional time with God a priority. If you’re too busy to pray, you’re too busy to serve! When you have such a busy schedule, it can be difficult to find an hour to really set aside for meditation and to read the Scriptures. But this is where you will draw your strength from. Godly friends and good parishioners will only get you so far. Without the power source, you are powerless! It means keeping your family as your central priority. This is true both of married pastors as well as those who are single. If you’re married, it’s so important to keep your spouse central to your ministry. To make time for him or her and to not neglect his or her needs. If you’re single, it’s important not to overwork yourself under the myth that you have no other responsibilities. When your friends start complaining that you aren’t as present as you used to be (or that you are tuning out when you are with them), it’s time to re-evaluate and make a change. Trust me: some of my friends have mentioned this to me before! I (and you) need to listen to them! It might mean serving in a different area. My main calling in life is to serve adults with developmental disabilities. I absolutely love this, but I also long to do something more in the organized church. That’s why volunteering in the creche or even ushering has become so important to me. It adds a bit more variety in my life – though be careful with how much you are willing to take on. If you’re already feeling burnt-out in your central ministry, you might want to scale back a bit rather than adding even more activities. It means listening to yourself, to your body, and to God. 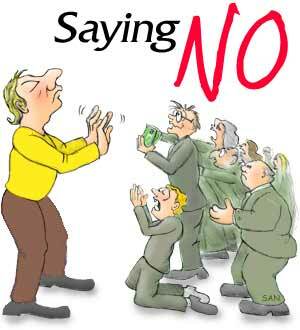 It’s learning how to say no, how to accept that you can’t do it all, how to relinquish control. It’s not beating yourself up if you can’t (or simply don’t want to) do something. It’s having the courage to ask for help when you are feeling overwhelmed. It’s being able to embrace your limitations. Self-care can be a difficult skill to master and the journey can be quite demanding and challenging at times, but it is always so worth it. When you feel good about yourself and your ministry, it will trickle down to all those you are serving and you will become a much more effective minister of the Gospel. May God bless you, lead, guide, and direct you on this exhilarating mission!